Januvia is a brand name version of the generic medication sitagliptin and is used in the treatment of type 2 diabetes to help control blood sugar levels by regulating the insulin levels in your body. Blood sugar levels rise after eating and in a person with type 2 diabetes, the production of insulin is too low and sugar production too high thus leading to high blood sugar levels. Januvia is taken once a day and works in two ways to lower blood sugar; it helps the body to increase the insulin made in the pancreas and to decrease the sugar made in the liver to lower blood sugar levels. Januvia treats type 2 diabetes mellitus by helping regulate blood sugar levels in the body after eating. This medication works to lower the production of sugar in the liver and increase the production of insulin in the pancreas. 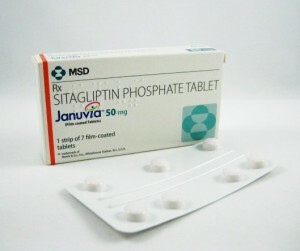 Sitagliptin works by blocking a substance in the body known as DPP-4 that interferes with regulating blood sugar levels. When DPP-4 is blocked the result is lower blood sugar levels. Januvia is to be used only for type 2 diabetes and is not an effective treatment for type 1 diabetes.